This badge was issued to David Glassborow on 01 May 2018. 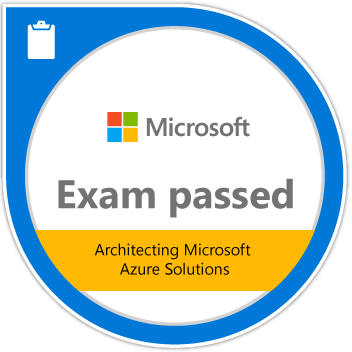 Passing Exam 535: Architecting Microsoft Azure Solutions validates the earners ability to define the appropriate cloud native, cloud migration, and hybrid cloud solutions to meet the required functional, operational, and deployment requirements through the solution lifecycle. Candidates demonstrate an understanding of DevOps technologies, provisioning Azure resources using ARM templates, and designing highly resilient workloads running on Azure.